We’re often asked how much a house extension costs in London. Extending the home is a popular option among clients who perhaps need another bedroom, an office space, or a living area, without the hassle (and stress) involved with moving house. 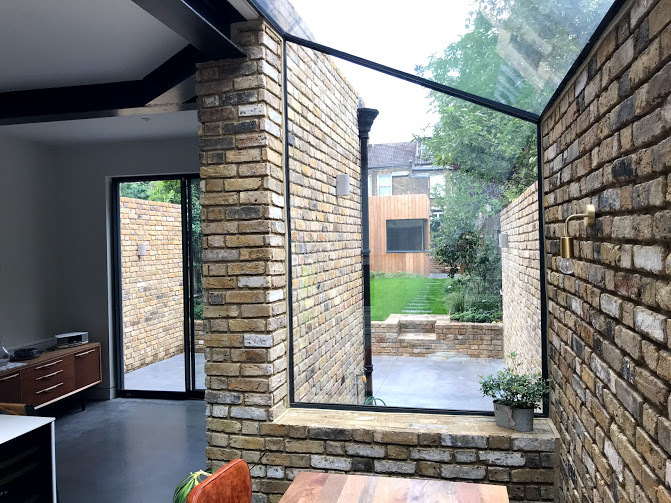 Although home extensions in London generally cost more than elsewhere in the UK, they remain a viable and cost-effective option to create your ideal additional living space and increase the value of your home. In this post, we set out the main costs associated with a house extension project. You generally have three options for extending your home: single storey, two storey or basement. The construction cost of extending the ground floor of your home (in a single storey) is, as a general rule, between £2,200 and £3,900 + VAT per square metre, depending on the level of the specification you decide on. This is a popular option for extending into the back garden to add a dining area, studio or additional living space. 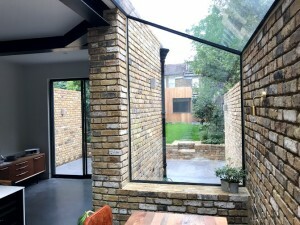 It is also an excellent way to bring more natural light into the property, with the ‘glazed envelope’ (like the one in the above image) making the new space feel very spacious and ‘open’. If you plan to use the new space for a kitchen or bathroom then the cost of the fitting will need to be included (typically expect an additional £10,000 + VAT for a kitchen [low-mid level of specification] or £5,000 + VAT for a bathroom [mid range]). A two-storey extension generally costs an additional 50% of the construction cost of a single storey extension. It gives you the option of adding an upstairs bedroom or other room and the investment will seem like good value as once the foundations and other structural supports are in place, you do not need to bear these costs again for the second storey. It is important to note that a two storey extension may impact on the amount of light reaching your garden and may also present additional complexity in the planning process (achieving consent for a two storey is often more difficult that for a single storey and sometimes not permitted at all for example in a Conservation Area). A basement addition tends to be the most expensive option per square metre because of the structural and construction complexity and risk. The construction cost of a new space in your basement in London is likely to amount to between £4,000 and £5,000 + VAT per square metre. The costs may be less if you have an existing basement which may instead need converting or extending partially. In addition to the estimated costs set out above, you will also need to factor in the cost of the professional services that you require, such as an architect and any other consultants that you need to involve – for the majority of projects you’ll need a Structural Engineer, Party Wall Surveyor, Building Control Approved Inspector and sometimes a Mechanical & Electrical Engineer as well as a Quantity Surveyor. This typically adds 15-28% to the construction cost. There are also planning fees (£200 to £300 for a house extension, although some extensions may fall under Permitted Development Rights), home insurance costs, and VAT. The costs of windows, doors and central heating will also be in addition to the costs already listed. There can also be costs associated with mitigating the constraints of a site. For example, the soil type may affect the type of foundation required or the types of building material that can be used, or there may be trees, drainage or other pipework that need to be (re)moved to allow access. If your property is listed and/or situated in a conservation area, you will need to allow for higher costs overall. Despite the long list of costs, a home extension can greatly improve your living space and also increase the value of your home by 10% to 30%. We take pride in the home extensions that we have completed for our clients and it is always a pleasure to bring more light and space into the home. You can browse some of our recent residential projects here. If you would like to discuss a potential project with us, please get in touch.